Crusaders in the 12th and 13 Century. Monastic robes and armor. Home » Crusaders in the 12th and 13 Century. Monastic robes and armor. Top row left: Nuns of the Order of St. John. 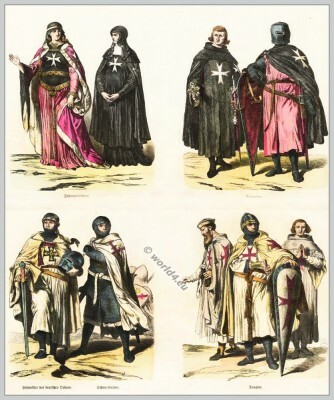 Right: Knights of the Order of St John monastic robes and armor. Bottom row left to right: Grand Master and sword brother of the Teutonic Order of Brothers of the German House Saint Mary in Jerusalem, Ordo Teutonicus. Right: Knights and monks of the Order of Knights Templar. The Crusaders in the 12th and 13 Century. Medieval military religious orders. The Carolingian fashion period 7th and 8th century. Reign of Charlemagne. This entry was posted in 12th Century, 13th Century, Ecclesiastical, Germany, Middle Ages, Military, Nobility and tagged Crusaders, Gothic costumes, Knighthood, Medieval costume, Monastic clothing, Münchener Bilderbogen on 1/27/14 by world4.